In March 2009, the Guardian and the Observer published a daily supplement which, when combined, became 1,000 Songs Everyone Must Hear. Part 2 was entitled Heartbreak and the records included Crazy (Patsy Cline), Crying (Roy Orbison), Always On My Mind (Elvis Presley) and Cold Cold Heart (Hank Williams). I’ve no complaints about most of the choices, but surely Billy Fury merited an entry. Among singers of his era, I would contend that Billy Fury was the Heartbreak Kid. Let’s look at the opposition. 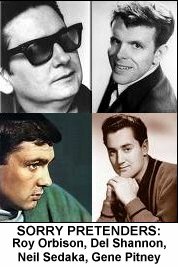 In his personal life, Roy Orbison knew about heartbreak and loss. He sang Only the lonely know how I feel and his hit records include It’s Over, Love Hurts and In Dreams. But there are also lots of happy songs; He gets the girl in both Running Scared and Oh, Pretty Woman, and there’s also Mean Woman Blues, You Got It and Claudette, a song dedicated to his wife. Is there a happier record than Lana? He’s so delighted that he’s got the girl, he can’t stop laughing. He’s in trouble in Workin’ For The Man as he fancies the boss’s daughter and so the relationship could lead to a Dear John letter and a P45. Orby doesn’t see that way – he’s resolute. One day, he’s going to be The Man. What about Del Shannon, a man who was so neurotic that he committed suicide? There is paranoia throughout his work – right from the start with Runaway – and although there is unrequited love in his songs, there are other messages as well. He really was a Stranger In Town, the most suspicious and mistrustful of all 60s songs. Del loses his girl in Hats Off To Larry, but it’s an odd lyric – Larry has broken her heart so Del is vindictive but happy. He warns you off the Little Town Flirt – well, at least in theory. It’s clear that he fancies her like mad. In Keep Searchin’, he has the girl but he’s in flight, although the reason for escaping is not revealed. There’s something that the community doesn’t like about his girl: She’s been hurt so much, They treat her mean and cruel. It is probably a song about racism, and if so, hats off to Del for writing this. There are other curious records in Del Shannon’s catalogue, often adding to the tension. He overhears a conversation in You Never Talked About Me and assumes that his love affair is over, a classic example of listeners never hearing good of themselves. There’s an example in Billy Fury’s work too where he is caught out in Cross My Heart, but the question in that song is Do we believe him or not? When it comes to being hurt, Gene Pitney liked to shout it from the rooftops with his big-voiced ballads. I’m Gonna Be Strong is a great example. He is drenched in self-pity as the young lovers vow to stick together in Town Without Pity. One of his songs, Half Heaven, Half Heartbreak would have been ideal for Billy Fury. 24 Hours From Tulsa is so neurotic that it could have been written by a psychiatrist. Gene gets the girl, but not the one he expected. This is a very American song: it wouldn’t work in England as you’re not 24 hours from anywhere. Once again though, Gene Pitney usually gets the girl – Just One Smile, Something’s Gotten Hold Of My Heart and. I Wanna Love My Life Away. Neil Sedaka has many heartbreak songs such as Breaking Up Is Hard To Do and Oh Carol but there is also I Go Ape, Little Devil, Laughter In The Rain and the now very dodgy Happy Birthday Sweet Sixteen. In a similarly dodgy category is Elvis Presley’s Kissin’ Cousins. Interesting, isn’t it, that Elvis Presley’s run of hits was broken by a heartbreak song, One Broken Heart For Sale, in 1963? Maybe El’s fans preferred him as the romantic balladeer of Can’t Help Falling In Love and Love Me Tender. The songs were often about going one step further with Elvis – Don’t and It’s Now Or Never. It’s said that Colonel Parker did not like Elvis singing songs about girls who had hurt him. On the other hand, Colonel Parker’s wife had suggested Are You Lonesome Tonight, an ultimate heartbreak record. In the 1970s, Priscilla left Elvis in real life and when it came to recordings, this time it’s personal. 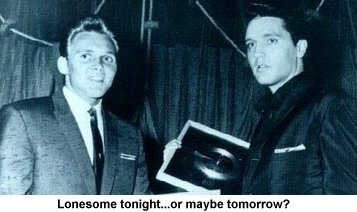 Elvis wanted songs which reflected how he felt such as Always On My Mind and My Boy, though it’s surprising that he didn’t change that one to My Girl. And so we come to Billy Fury, whose oeuvre is more neurotic than Roy Orbison’s or even Leonard Cohen’s. He started with the anxiety-ridden ballads, Maybe Tomorrow and Margo and many of the tracks around the time of The Sound Of Fury are heartbreak songs such as Phone Call and You Don’t Know. Heartbreak came in big time with Halfway To Paradise, a song of frustration like Don’t, It’s Now Or Never or Will You Love Me Tomorrow. There’s a similar frustration in his rocker, Nothin’ Shakin’. Then there was a stream of heartbreaking ballads - Last Night Was Made For Love, When Will You Say I Love You, Once Upon A Dream and In Thoughts Of You. He’s tortured in Somebody Else’s Girl, while the girl is not as keen as he is in Fool’s Errand. In later years, there is Devil Or Angel and Be Mine Tonight (and end my misery). Indeed, one of the few songs in which Billy Fury is really happy is I Gotta Horse! Elton John sang Sad Songs Say So Much and I wonder if they do. Is it simply coincidence that Billy Fury recorded so many heartbreak songs or do they reflect his feelings? 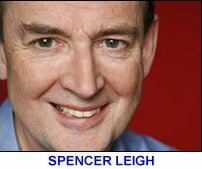 Spencer Leigh is one of the country's foremost writers on popular music culture. He has a regular programme on BBC Radio Merseyside. His books include the Billy Fury biography, Wondrous Face. Spencer contributed this exclusive feature to billyfury.com at Christmas 2009.